BENTONVILLE, Ark. (BRAIN) — This community, which already has hosted an IMBA World Summit, Outerbike and other bike events, will be home to the new Innovation Cycles Festival in mid-September. "Think of it as Ted Talks for the e-bike industry," said event organizer Nat Ross. GIRONA, Spain (BRAIN) — Organizers of Sea Otter Europe have announced that the third edition of the festival will be held May 31-June 2, 2019 — once again in Girona, Spain. BOULDER, Colo. (BRAIN) — VeloSwap, the consumer bicycle swap and expo, expects to see over 5,000 cyclists browsing more than 300 vendor booths on Saturday, Nov. 3, at the National Western Complex in Denver. SHERBORN, Mass. (BRAIN) — Steve the Bike Guy Velo Studio hosted more than 15 women on Sunday, May 20, for the inaugural STBG Women Who Wrench Clinic at Unity Farm in Sherborn, Massachusetts. Brose, BMC sign on for media summit. 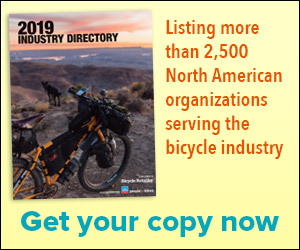 KETCHUM, Idaho (BRAIN) — CrankTank announced that it has sold all its e-bike opportunities and closed the sponsorship category for next month’s Impact Sun Valley media summit. BOULDER, Colo. (BRAIN) — Ergon introduced its first women’s saddle with a women’s-only saddle demo and launch party at Sports Garage in Boulder in late January. Organizers announce summer edition to be held in Les Gets, France. MASSA MARITTIMA, Italy (BRAIN) — Ten brands and 16 journalists from global media outlets took part in the inaugural edition of Bike Connection Winter, a cycling media event presented by marketing and business development consultancy Bike Connection Agency. KETCHUM, Idaho (BRAIN) — CrankTank has hired industry veteran Chad Battistone as sponsorship sales manager for the consulting agency’s inaugural Impact Sun Valley Media Summit. BOULDER, Colo. (BRAIN) — The North American Handmade Bicycle Show has added the inaugural NAHBS Women’s Symposium to the seminar schedule for next month’s show in Hartford, Connecticut. SQUAMISH, British Columbia (BRAIN) — Early registration has opened for the Whistler Bike conference, scheduled for May 23-25. The event focuses on digital marketing and is organized by Pinkbike.com and Whistler Mountain Bike Park. Retail attendance continues to be highly regional at Interbike’s East Coast trade/consumer festival. CHARLOTTE, N.C. (BRAIN) — On what was expected to be the peak day of Interbike's second annual Fall CycloFest trade and consumer festival, cyclists lined up at the Specialized booth all day Saturday to try out one of the Morgan Hill, California, brand's dozens of bikes available for demo at host venue the U.S.
BOULDER, Colo. (BRAIN) — Camber Outdoors has announced six Camber Exchange events this fall. Three of these events will be the first-ever Camber Exchanges in their regions.